Our Lady of the Fence Post (J H Crone, UWA Publishing) – an imaginative response to news reports of the appearance of a Marian apparition on the construction site of a memorial for victims of the Bali bombing at Coogee, Sydney, in January 2003. 1917 (Kelly Gardiner, Scholastic) – The German planes patrolled in hunting squads. They flew fast fighting craft streaking across the sky in tight formation. The greatest of them was the Red Baron, the deadliest ace on the Front. Hed shot down twenty-one of our planes ina single month. And now were were in his firing line. The war in France rages in the skies, and support for the war in Australia turns cold. Alex flies high above the trenches of the Western Front, while a world away his sister Maggie finds herself in the midst of political upheaval. Somehow, both must find the courage to fight on. 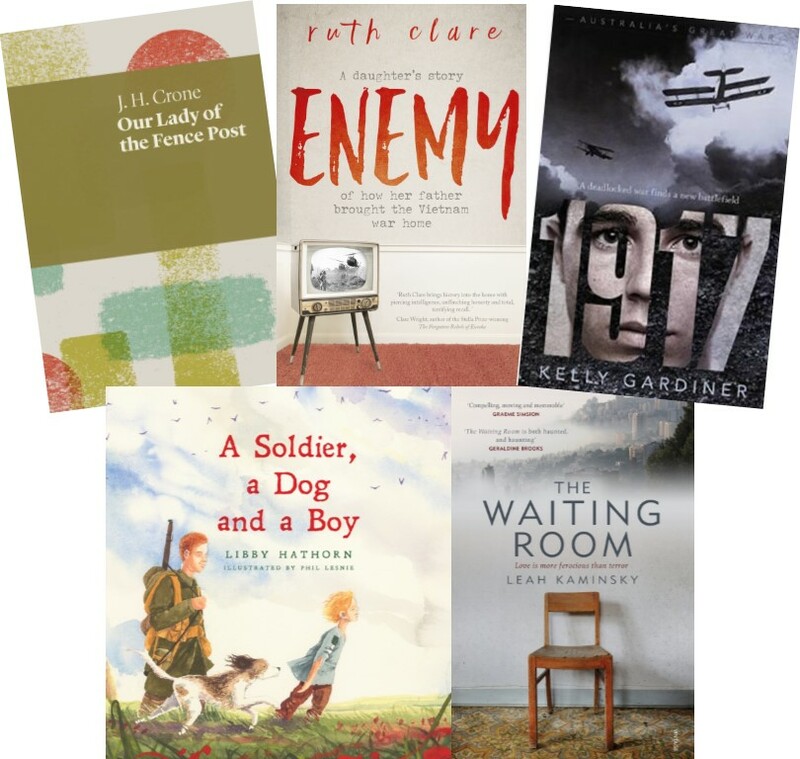 A Soldier, a Dog and a Boy (Libby Hathorn, illus by Phil Lesnie, Lothian) – A moving story for kids, told completely in dialogue, about a young Australian soldier in the battle of the Somme. The Waiting Room (Leah Kaminsky, Vintage) – Winner of the Voss literary prize. Compelling, moving and memorable. The Waiting Room captures the sights, sounds, accents and animosities of a country overflowing with stories. This entry was posted in Australian Authors, Awards & Prize Lists and tagged Asher Award 2017 Shortlist, Parramatta City Library, War writing by admin. Bookmark the permalink.